While much of Europe has been forced indoors by a fierce cold snap, the Dutch have been elevated to a state of euphoria as skating fever grips the nation. Frozen canals, rivers and lakes have transformed the Netherlands into one enormous ice-rink. Sports shops have sold out of skates, bike suppliers are swapping their cycles for sledges and all over the country people are having their blades sharpened ready to take advantage of the ice generated by exceptionally cold winter. "It's in our genes. We've been skating for centuries," explains Bert van Voorbergen, who runs an online skating museum in the town of Almere. "Every year when frost comes, there's something indescribable released inside. As soon as there is ice, everyone is the same, everyone is equal. Maybe that's why we love it so much." What stirred most excitement in the Netherlands was the chance that this year, for the first time since 1997, it might be cold enough to hold the ice race to end all ice races: the "Elfstedentocht" or Eleven Cities Race - the biggest competition held on natural ice in the world. It covers 200km (124 miles) of land, features 16,000 skaters and can attract more than two million spectators. The nation was buzzing, Dutch media covering every twist and turn in a story that filled much of the main evening news broadcasts on national TV. 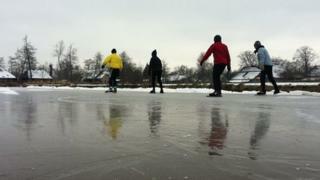 A tweet from Olympic speed-skating Gold medallist Mark Tuitert summed up the sentiments of skaters across the country who say they've been struck by "Elfstedentocht fever". Bike shop owner Martin de Vries told me he was in school when it was last held 15 years ago. "We didn't have internet then, only radio, and everywhere you went everyone was tuned in to the race. It was crazy, everyone rushing home to try and catch it on TV. Or if you were lucky enough to get tickets, of course, you'd be up there cheering on the skaters." But on Wednesday night came the news millions had been dreading - the organisers announced: "It's not on." For the Elfstedentocht to go ahead, the temperatures must stay below freezing and for the past few days in Leeuwarden my thermometer's mercury has been bobbing around the -3C mark. But it is also essential that the ice remains thick so as not to crack under the pressure of 16,000 skaters. The Frisian Eleven Cities Association - set up to measure the ice and monitor the conditions - says it needs 15cm (6in) of ice covering the entire track before they can say those mythical words "it's on". At the moment some parts of the route have only half the depth required. Every year the "will-they-won't-they" speculation surrounding this legendary race starts to swirl around towns, villages and all over the media at the first signs of a frost. The race tradition began in 1909. The last contest was won by a turnip farmer. And this year the Netherlands recorded its lowest temperatures in 27 years. Preparations have been underway for days. A team of eager volunteers - assisted by a small army of soldiers based near the Friesland route - has been helping to shovel away the snow to give the ice the best possible hope of staying strong. But in the end it seems their best efforts were in vain. After the decision, the association's "ice master" Jan Oostenbrug urged skaters not to despair and instead get out on the ice and skate their disappointment away. There is a small chance the race will still go ahead later in the season. But with a thaw forecast for Sunday, hopes are fading like the frost. Many are resigning themselves to the cold hard fact that they may have to wait another year before Elfstendentocht fever strikes again. However, skaters have been turning up in their hundreds in the village of Giethoorn, just outside Friesland, to race on a shorter course that runs for more than 25km between villages and does not have the same stringent regulations as the official Eleven Cities race. Although the skaters are still holding out hope that the main contest can go ahead, for now they are making the most of the freezing conditions. Q&A: Why is it so cold across Europe?